Well, I've learned now that they love Shopkins and some other little toys, so I'll probably do a zipper bag for treasures for them. Thanks for that reminder. Thank you. I like pinterest but I forget to look there for ideas. I spent a long time last night looking at barbie patterns and realized that sewing instead of ith would be better fory sanity and my bank account. Thank you. 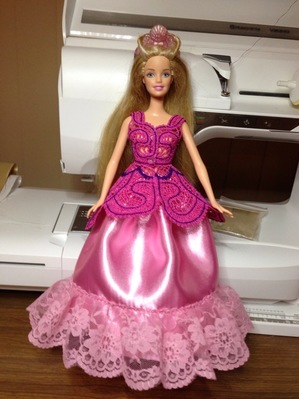 I bought a lovely FSL design set to fit Barbie, from Stitch Delight, VIA Secrets of Embroidery. You will need to do a bit of sewing but very easy to do. I made some for my GD. Scroll down to the second row. PS. the skirt overlay can be turned around if you don't stitch it the the bodice. My GD loved it. I have books full of crochet patterns and sewing patterns as I used to make porcelain dolls and dress all types of dolls. I still have about 30 Barbie dolls in a box downstairs. I found most of my patterns online, mostly free. The satin skirt is just a basic semi-flared, one piece, skirt pattern gathered at the waist by making a hem, threading narrow elastic through and stitching the ends down when joining the back seam. McCall's and Simplicity used to carry patterns. Thank you. I had thought I would try to find something totally in the hoop, but I've realized I'm better off looking at different ideas.